I usually make lots of tags during the year to use up those small snippets of cardstock, and tags will definitely make good use of those small bits of cardstock. I used some Poppy Tiny Fawns dies to make the deer, and hand-drew in the faces. Next time I'll leave the faces blank or just add a dab of red glitter for the noses. I used bits of green and black cardstock, and cut them with a SU! scalloped top tag punch, adding some older deer ribbon I've had for eons. The white birch trees were done with an unmarked stamp generously gifted to me by a friend, and I heat embossed it with white ep. For the black tag, I die cut a silver mirror card circle for the punched hole before adding ribbon, then tied the ribbon with some black & white twisted twine. I just toss these tags into a box and have plenty to share with my friends at the end of the year. I'm sharing these with the Simon Says Stamp Wednesday challenge which is to make Christmas gift tags. I'm also sharing them with CHNC Craftyhazelnut's Christmas Challenge Extra for November - which is anything goes as long as it's Christmas. Thanks for checking in today and have a great weekend whatever you do! 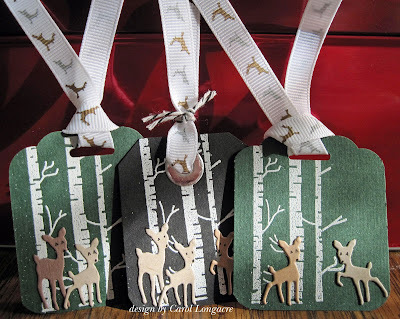 I love these cute tags Carol,the little deer are so sweet and look great with the white embossed trees. Super tags Carol, lovely forest scenes. You are so inspiring, Carol! Making tags with snippets and leftovers is a great idea. Love these cute deers and the embossed birch trees, such pretty scene! The matching ribbons are just perfect! Your friends will be delighted to receive these beauties! Your tags are so cute. I love the design and great scene on them. I usually don't make tags as I usually give mostly cash these days except for the grandkids and after a certain age they get cash too as they need to buy gas for their cars. I love the woodland feel of these lovely tags. Sweet little tags! Those tiny deer are just adorable! Love these fantastic tags! The deer are so tiny and cute and love the tree background for them too. The deer ribbon just tops it all off perfectly! Wonderful tags Carol! I love the white birch trees and the little deer are adorable. Wonderful tags which will enhance any parcel little or big. How CUTE!!! The little deer are the cutest things! And I agree, tags are perfect for using up little bits of this and that. Thanks for playing with CHNCC2.